"John R was a good man... an all the way good man." That's what Lattimore told me. Anyone else I've ever spoken with who knew him has said the same thing. This was a straight shooter, an honest man who treated his artists fairly, and expected the same in return. As we've seen, he was willing to 'go to the wall' to get the sound he wanted, driving to Memphis on a regular basis to record with the best in the business. 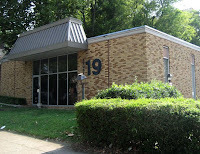 After five years of his association with Fred Foster and Monument Records, his J.R. Enterprises had leased over 75 singles to Sound Stage 7. In 1969, though, something changed. Shut out of Memphis once again, John was determined to try and create his own 'house band' right there in Nashville. He worked out a deal with Scotty Moore, who had recently opened his own Music City studio on 19th Avenue South, and set about making that happen. Continuing to use our man Bob Wilson as the session leader, he put together the band he would come to call 'The Music City Four', which would include top shelf musicians like Kenny Buttrey, Mac Gayden and Tim Drummond. It was Wayne Moss' bass line on a song written by Monument's Harlan Howard that paved the way for all of this, and proved to Fred Foster that it was possible to pull it off. 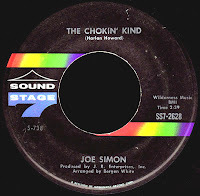 Richbourg had been recording Joe Simon at American in Memphis, and had also done some sessions with him at Fame in Muscle Shoals (resulting in one of our fave B Sides), but none of those records could touch the phenomenal success of The Chokin' Kind. When John R played the master for Fred Foster he told him "I think you need to remix it. The bass is way too hot." John asked him to trust him on this one, and released it the way it was. The record would spend over three months on the charts, including three weeks at number one R&B. Fred, of course, had been wrong, and he was ecstatic about it. The label had never seen that kind of success before and it kind of changed everything. Foster, for whatever reason, didn't seem as interested in leasing as much material from J.R. Enterprises as it had in the past, and decided to concentrate on Simon, hoping for a repeat performance. 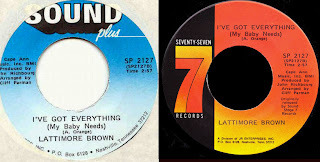 By mid 1969, Roscoe Shelton, Sam Baker and Sir Lattimore Brown were all gone, and in addition to Simon, Richbourg's Sound Stage 7 releases were new Nashville productions on folks like Ella Washington, Jackey Beavers and Moody Scott. John R started up two of his own labels at this point, called Sound Plus and Seventy 7, which were apparently created to serve as an outlet for the stuff that Monument wasn't interested in. 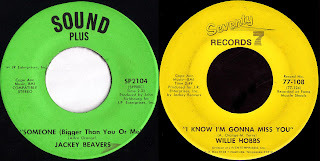 Although he would release some truly great 45s on a roster of artists that would come to include Willie Hobbs, Earl Gaines, and Ann Sexton (among others), the records weren't selling, and without the big company behind him, there wasn't much of a budget for promotion. 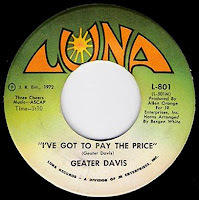 He would form yet another (albeit short-lived) label named Luna somewhere around in here, and helped to bail out his partner Allen Orange's own floundering House Of Orange imprint by signing Geater Davis. Moving Davis over to Seventy 7 eventually, he managed to break into the R&B charts for the label. Orange became his full-time promotion man. There are those who say that this was a mistake. What little money Richbourg had soon began drying up, and he found it difficult to pay for studio time. 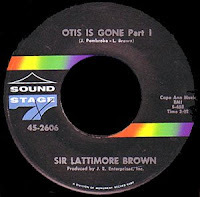 Turning to the mountain of material he had 'in the can', John R began releasing Lattimore Brown records once again. J.R. Enterprises had retained the rights to all of the masters they had recorded for Sound Stage 7, and re-released some of that material (sometimes on both labels at once! ), in order to keep up a steady supply of 'product'. 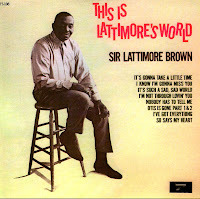 He would go so far as to release an LP called 'This Is Lattimore's World', which was composed entirely of stuff that had been previously recorded. Lattimore told me that he never knew the album existed, and had never even seen a copy. Of the twelve tracks on the record, seven had been released on Sound Stage 7, and three more had been issued as singles on Seventy 7. 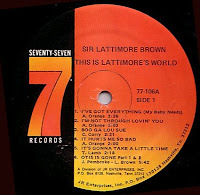 These singles, like the awesome number you're listening to now, represent some of Lattimore's best material. 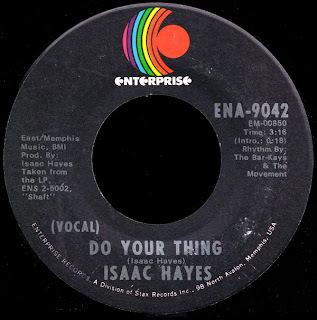 Try as I may, I have been unable to determine where and when these records were cut (except for the flip of our current selection, Don't Trust No One, which, as we've seen was recorded at Stax). Songs like So Says My Heart and It Hurts Me So Bad (which was an LP only track) are just fantastic, and I find it hard to believe that Fred Foster passed on them. For that matter, I don't understand why Lattimore was let go, based on the quality of this material. When I asked him, he just kind of shrugged. There is some bogus story about how his 'lack of focus' in the studio irked Richbourg, but I don't believe that... especially in light of those awesome Renegade cuts he did with Chuck Chellman almost immediately after he was given his walking papers. As I was getting ready for this post, I noticed that this wonderful song we have here was co-wriiten by Lattimore and 'C.Curry'. 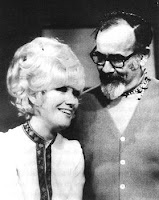 C. Curry had also been the composer on one of the LP only tracks, Boo Ga Lou Sue. This had to be Clifford Curry, I figured. I was able to track Clifford down through his manager, Joe Meador, and spent a delightful hour on the phone with him. He's remained active in the business, and continues to make 'shag' records for the beach music crowd, even though he lives in Nashville. Like most everybody else, he thought Lattimore was dead, and he couldn't believe we had found his long lost friend. 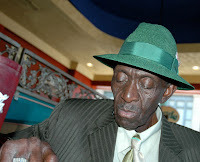 He told me that he met Brown when he came into Knoxville to play a gig at Harper's V.I.P. Lounge, and that he liked the town so much he decided to stay. The two became fast friends, and hung out together all the time. 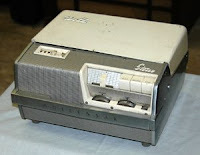 Curry, who wrote most of his own material, recorded demos of his songs with a piano player named Winfred Doggett on a little Wollensack tape recorder that he had. 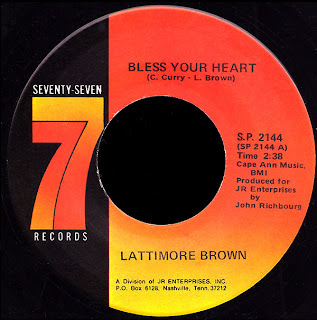 Lattimore liked two of the songs, and brought them to John R in Nashville. Clifford never heard another word about them, he said, and didn't know if they had ever been released, or even recorded, until now. This was all news to him... incredible. 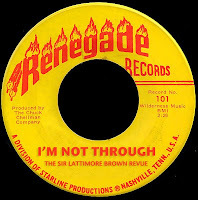 Just as he had done in Dallas, Lattimore opened up a club in Knoxville and re-activated his booking agency, using the connections he had made through his many years in the business to bring in top name acts. He had gotten married, and he and his wife ran the place, calling it The Silver Slipper. When she died following open heart surgery to correct a congenital valve defect, it laid him low, he told me. He closed the place down and walked away from the music business altogether... at least temporarily. OK, I've put together a podcast of some of the records we've been talking about here that haven't been posted so far. It starts out with Lattimore's other two Renegade sides, then goes back to some Zil, Duchess, Sound Stage 7 and Seventy Seven material. 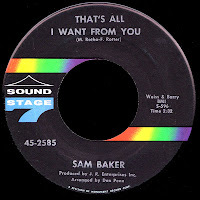 I've also included those Roscoe Shelton and Sam Baker sides that were cut at Stax, as well as the ones that were arranged by Dan Penn at American Sound, among a few other things. As always, you can listen to it over there in the sidebar, or check it out here. As the last living link to the glory days at Atlantic Records passes before our eyes, please take a moment with me to reflect on a life well lived. An absolute giant of the 'Soul Era', I don't think you can imagine the music without him. His influence is still felt today, and he remained his wry and lucid self right to the end, providing the top shelf liner notes to Aretha Franklin - Rare & Unreleased Recordings from the Golden Reign of the Queen of Soul just last year. Jerry wrote this great song we have here with Pickett down in Muscle Shoals in 1967. It would break into the R&B top ten that summer. He was proud of that. Wexler grew up in Washington Heights where he developed a fondness for poolrooms, reefer, and Jazz. He and his record collecting pals would scour the city for rare 78s by day, and hang around the clubs by night, listening to the hottest music they could find. They got in on the ground floor of the 52nd Street Bebop explosion, and were usually smoking the same stuff the cats in the band were. It must have been a time! 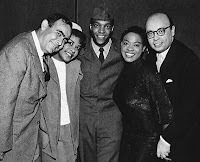 Jerry would often run into John Hammond out there, the man who had brought Bessie Smith and Bille Holiday to Columbia Records. Hammond was all Fifth Avenue money and class, while Wexler, the son of an immigrant window washer, was anything but. He longed for 'the life'... someday, baby, someday. After a stint in the Army (which he spent stationed in an art deco hotel in Miami Beach), 'Wex' got himself a job writing copy for the newly formed BMI, which led, eventually, to his being hired by Billboard magazine, the music industry bible. 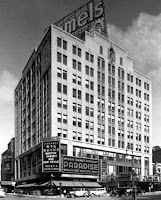 He became a Brill Building regular, 'working' the offices of all the writers and publishers, while keeping his ear to the ground to pick up what was happening on the streets. 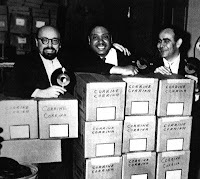 In 1949, Paul Ackerman, editor-in-chief of Billboard's music division, asked his employees to come up with a better term for their 'race records' chart, which was geared towards African-American music. It was Wexler who came up with the term 'Rhythm & Blues'... it stuck. As we've discussed before, when Jerry was offered a job at Atlantic Records in 1953, he told Ahmet Ertegun and Herb Abramson that he wouldn't work for them unless they sold him an interest in the company. Much to his surprise, they agreed. He dove right in, handling much of the mundane details of running the store ("licking stamps," as he put it), while picking up the nuts and bolts of 'producing' from Ahmet and Tommy Dowd as they recorded Atlantic 'product' right there in his office. He was a fast learner, and was soon an equal member of the team. 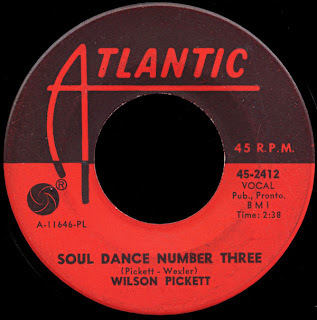 Whether composing Honey Love with Clyde McPhatter or chiming in with the background vocals on Big Joe Turner's Shake Rattle & Roll, he quickly became an integral part of Atlantic's 'sound'. He began traveling down south with Ertegun, running sessions at Cosimo's studio in New Orleans with legends like Professor Longhair and Guitar Slim. Jerry truly loved the city in those days, and prides himself on being one of the few white guys to ever stay at the Dew Drop Inn. 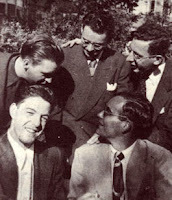 This kind of 'field recording' would continue, with Wexler and Ertegun flying south to record Brother Ray whenever he was ready. He was there at the Atlanta session that produced I Got A Woman... imagine? By the time Herb Abramson got out of the Army in 1955, it was obvious that Wexler had taken his place. It was no coincidence that Atlantic's rise to prominence on the R&B charts had occurred while Jerry was 'working the phones'. Abramson saw the handwriting on the wall, and decided he wanted out. 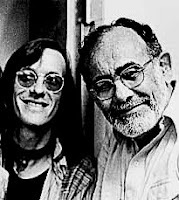 Ahmet's brother Nesuhi, meanwhile, had worked out a deal with west coast writing and production team Jerry Lieber and Mike Stoller to bring them to Atlantic. Closing down their own Spark label, they brought their unique story-telling style to ATCO, a new subsidiary label that Atlantic had created. They turned operation of ATCO over to Abramson (along with a new kid they had just signed named Bobby Darin), hoping they could make that arrangement work. After Darin's first few singles tanked, Abramson demanded that they buy him out. Scraping together all the money they could find, Ahmet, Nesuhi, and Jerry did just that, becoming equal partners in the company in 1955. 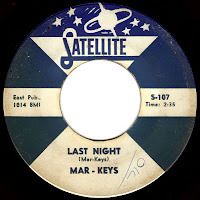 By 1960, the heyday of Atlantic's R&B roster was just about over. Ray Charles had left for greener pastures at ABC and Bobby Darin (after his run of smash hits like Mack The Knife and Beyond The Sea) was on his way out the door. When Solomon Burke showed up one day out of the clear blue sky, Wexler signed him right then and there. His production of the Country ballad Just Out Of Reach (Of My Two Open Arms) was absolutely fantastic, going top ten R&B and top 40 pop. The 'Soul Era' at the label had begun. One of the unsung heroes of the Atlantic saga was a guy named Joe Galkin. 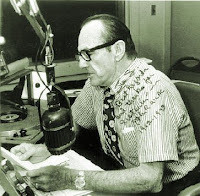 He worked as their southern promotion man, driving around in a constant flurry of activity from one radio station to another, bestowing gifts and pearls of wisdom amidst the clouds of cigarette smoke and banlon shirts. He called Wexler regularly with updates on what was hot and what was not down south. It was Galkin who hipped Jerry to Jim Stewart's fledgling Sattelite Records label (soon to become STAX), and got them their infamous Atlantic distribution deal. It was Joe Galkin who had started a label with Otis Redding (Jotis), and was instrumental in recording These Arms Of Mine at the tail end of a Johnny Jenkins session at STAX. It was Galkin who handed Rick Hall the phone one day, so he could tell Jerry about When A Man Loves A Woman. Suffice it to say that Wexler valued his opinions highly, and loved him for the character that he was. Jerry was astonished by the southern style of recording that used 'head arrangements' and wasn't bound by charges for studio time. 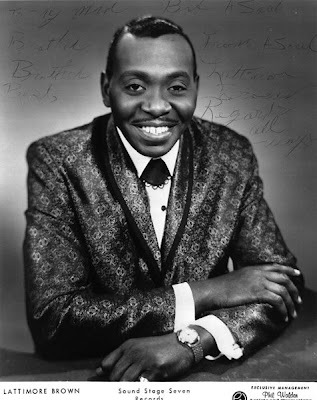 When he brought Wilson Pickett down to STAX in 1965, they were just as amazed with his hands on production style, and it was reportedly his demonstrating the 'Jerk' that put the beat of In The Midnight Hour squarely 'on the one', and helped create the studio's trademark sound. After Wexler brought Don Covay down there to wax See-Saw later that year, Jim Stewart apparently felt that Atlantic was trying to take over, and barred them from recording there again. Although he'd probably never admit it, I think Wexler was heartbroken at that point. According to Tom Dowd, "They were sweet, beautiful people, the folks in Memphis, and they'd be the first to say they learned as much from Wexler as he learned from them. Jerry would be demanding; he made them less laid back..."
Joe Galkin got Jerry hooked up with Rick Hall at FAME at that point, and he brought Pickett down to Muscle Shoals in the summer of 1966. To the young kids in Hall's rhythm section, Wexler (now almost 50) was like this mythic musical figure, and they were essentially scared to death. Wexler had brought Tommy Cogbill and Chips Moman with him from Memphis, and once the sessions got going things were just fine. Once again, his production was 'hands on', coming out from behind the board to coach the players and make sure he got what he wanted. It was Wexler's idea for Pickett to sing those "1, 2, 3s" at the beginning of Land Of 1000 Dances, very cool. 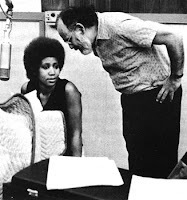 We've already talked about what happened when Jerry brought Aretha down to Fame in early 1967... Finding himself shut out of yet another southern studio, he brought the musicians to New York and finished production on the first of fourteen albums he would make with her. That incredible record, I Never Loved A Man (The Way That I Love You), was so important on so many levels. 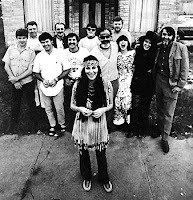 Wexler had shown his old hero John Hammond what Aretha was capable of (something Hammond had been unable to find at Columbia), while cementing his relationship with the Muscle Shoals crowd (telling them to give him a call if they ever wanted to go out on their own), and forging a new sound with the help of his in-house production team of Tom Dowd and Arif Mardin. "What Tommy was to engineering, Arif was to arranging, the super pro. What's more," Jerry said, "the two could easily switch roles. No producer has ever enjoyed better backup. they freed me up to direct, concentrate on the groove..."
I think it says a lot that when Otis Redding died in December of 1967, it was Jerry Wexler that was asked to eulogize him at his funeral in Macon. 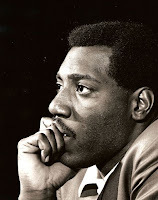 Unable to control his emotion, Wexler spoke of Otis' "love and tremendous faith in human possibilities... a man whose composition Respect has become an anthem of hope for people everywhere." A heavy moment. Seeking to continue the sucess he'd been having recording down south, Wexler had loaned some money to Chips Moman to upgrade the equipment at his American Sound Studio in Memphis. 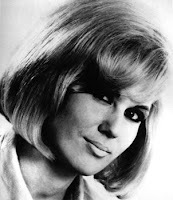 In the summer of 1968, he hatched a plan to bring Atlantic's latest acquisition, British pop superstar Dusty Springfield, down there to record. Springfield had come up as a 'folkie' in the early sixties, before being captivated by American soul music. Her career took off with hits like Wishin' And Hopin' and You Don't Have To Say You Love Me keeping her high in the charts on both sides of the Atlantic. Touring in those days, she became fast friends with Martha Reeves (performing as a Vandella from time to time), and introduced the British public to Motown as a host on the popular TV series Ready, Steady, Go. When her contract with Philips was up, she decided to sign with her idol Aretha Franklin's label in America. 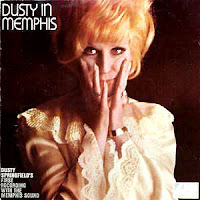 Wexler did his homework, and prepared a list of about 100 songs for Dusty to consider for the album. She didn't like any of them. He wasn't sure what to make of that, but he hung in there, and after "months of agonizing evaluations" they were able to settle on eleven tunes. One of those songs, Son Of A Preacher Man, had been slated for Aretha initially, but she turned it down. "All Jerry did was talk about Aretha, and I was frankly intimidated," Dusty later said,"If there's one thing that inhibits good singing it's fear. I covered the fear by being in pain. I drove Jerry crazy." "Tom Dowd wrote the horn parts for Son Of A Preacher Man on the plane on the way down to Memphis, and they're f#@*ing brilliant!," says Wexler. Oh yes, they are. With the 'Memphis Boys' and The Sweet Inspirations rarin' to go, Jerry, Tom and Arif were all set to produce this killer album. Only Dusty wasn't. She was so overcome by her fears that she refused to sing a note while they were down there at American. "I became paralysed by the ghosts of the studio!," she said, "I knew I could sing the songs well enough, but it brought pangs of insecurity. . . that I didn't deserve to be there." She ended up screaming at Dowd, calling him a 'prima-donna'. "The only prima-donna here, Madamoiselle Springfield, is you," Wexler retorted. 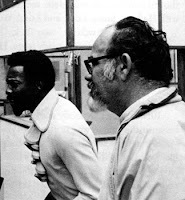 While Wexler was making his move into southern soul, Ahmet Ertegun had moved his base of operations out to L.A., picking up some of the pieces left behind by Sam Cooke's ill-fated 'soul stations' in the process. He scooped up Harold Battiste and the rest of the expatriate New Orleans crowd and was using them as arrangers and studio musicians on ATCO. 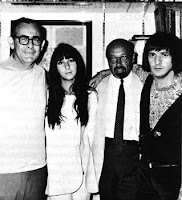 He also signed a young couple that had been hanging around Battiste and Phil Spector, Sonny & Cher. Their first single for the label, I Got You Babe (produced and arranged by Battiste), went straight to #1 in the summer of 1965. 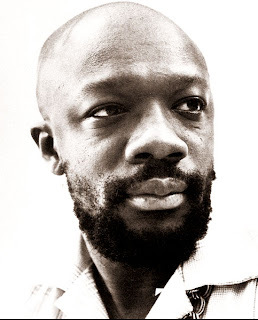 Ertegun became a fixture of the scene out there, and started his move into what would come to be known as 'rock', signing groups like Buffalo Springfield and Iron Butterfly. Wexler had grown close with Barry Beckett, Jimmy Johnson, David Hood and Roger Hawkins over the years, and considered them almost like a second family. When they finally came to him in 1969 saying they were ready to leave Rick Hall and Fame behind, Jerry was ecstatic. 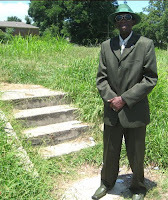 He gladly loaned them the money to set up shop in an old casket factory located at 3614 Jackson Highway in Muscle Shoals, and promised them beaucoup business from Atlantic. The first album recorded there, oddly enough, was by Cher. Considered somewhat of a cult classic, it was re-issued as part of Rhino's 'handmade CD' series a few years back. In an oft-repeated story, Wexler heard Mac Rebennack playing his Professor Longhair style of piano one night during a break at the studio, and turned on the tape machine. He had no idea of Mac's incredible R&B roots, and he was just blown away. He sent copies of the resulting tape out to his friends. 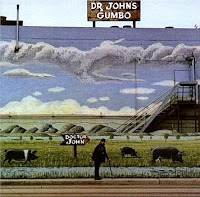 The music brought him back to those days down at Cosimo's almost twenty years before, and he convinced Mac to lose the whole 'night tripper' persona and record the great Dr. John's Gumbo album in 1972. Although it didn't sell (of course), Wexler still considers it one of the best things he's ever produced. Another of his favorites is the incredible Doug Sahm and Band, which was recorded in New York in October of 1972. Wexler has described Sahm as "the best musician I ever knew, because of his versatility, and the range of his information and taste." He surrounded him with great musicians (and Bob Dylan) and produced an all-time classic. It didn't sell either. This was around the same time that Jerry conceived the idea of establishing himself as the king of 'Atlantic South', setting himself up at Criteria Studios in Miami. It had been Jerry's idea to sell Atlantic to Warner Brothers back in 1967. Fearing the fate most of the other R&B indies had suffered, he reasoned that they should sell while they were at the top of their game. Warner ended up paying only about half of what the company was worth, and although they had guaranteed that all three partners would continue to conduct business as usual, Wexler just couldn't abide the 'corporate types', and he let them know it. As people like David Geffen began to insinuate themselves further and further into the company, Wexler grew more and more apoplectic, becoming persona non gratis at Board meetings and company functions. By removing himself to Miami, he had done them all a favor. The records he produced weren't selling, they continued to remind him, as they successfully marginalized his work. Perhaps the last straw came when Jerry decided to open a country division in Nashville, and produce two great albums on Willie Nelson that flopped. Finally, both sides had had enough, and in an emotional meeting in Ahmet Ertegun's office in 1975, Wexler basically painted himself into a corner. There was no way he could continue on as merely an employee, he said. It was time to go. 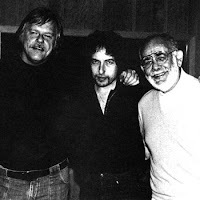 Jerry soldiered on as a freelance producer, and would win a Grammy for bringing another of John Hammond's discoveries, Bob Dylan, down to Muscle Shoals to record Slow Train Coming in 1979. "If there was any constant in my life, it was Muscle Shoals," Jerry said, "...maybe because the people in Muscle Shoals were both friends and admirers. Maybe because Muscle Shoals made me feel the way I'd felt when I first arrived there back in the sixties - like a participant in the music, a member of the rhythm section... I fell into a groove of comfort." The music Wexler's been a part of has stood the test of time, as has he. In a recent interview he said "Everybody seems to be coming to my door; BBC, NPR... well, there aren't too many people at the age of 90 that are coherent or even alive!" He never compromised his vision, ever. We should all thank him for that. That's what he was. Even before Shaft busted things wide open, his skills as a songwriter and arranger were one of the major forces behind the success of Stax. As the awards and recognition came, he never forgot where he came from. "If you feel like you wanna sing, 'cause singing is your thing - sing on." The way things worked in those days, a great deal of music industry business was conducted at the annual NATRA R&B 'disk-jockey convention', which was essentially a great big floating party that moved to a different city every year. Financed by the record companies, it gave them a chance to 'showcase' their artists, and make sure the dee-jays were well taken care of. In 1966, the convention was held in Nashville, which would have made John R the king of the roost. 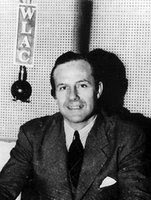 I'm sure he was approached by all kinds of people who wanted to get their records heard on the radio (as we've discussed before, this was the year that Huey Meaux got into all that trouble). He was also approached, I'm sure, by Chips Moman for another reason entirely. We know that Moman was there at the convention because that was where he and Dan Penn wrote The Dark End Of The Street. Chips was in the final stages of readying American Sound for its incredible run as the home of the hits. He had assembled his 'American Group' one by one, and had just about succeeded in luring Penn away from Rick Hall at Fame. He knew that Richbourg wanted that 'Memphis Sound', and he offered him the chance to get it. 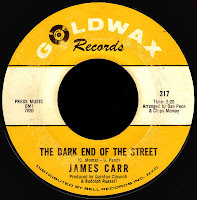 When the timeless record Penn and Moman had written for James Carr hit the streets in February of 1967, I'm sure John R played it to death. When he flipped over Aretha's number one hit a month later, there was yet another untouchable song by these two guys. Richbourg knew talent when he saw it, and would become one of the first customers through the door at 827 Thomas Street, along with Papa Don, Buddy Killen and Jerry Wexler. As near as I can figure it, Joe Simon's top 50 R&B hit Put Your Trust In Me (SS7 2583), which hit the charts that June, was the first side he cut at American. According to the label, it was arranged by Chips Moman. 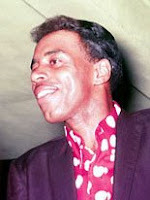 Chips would also be credited as a co-producer on the label's next release, the funky Jive Mother-In-Law by Jamo Thomas. Once again, though, our man Lattimore was there. We took him back to the overgrown vacant lot at Chelsea and Thomas where American once stood, and talked about what it was like recording there. He had nothing but good things to say about Moman, Penn, and the rest of those Memphis Boys. Willie Mitchell and his brother James were always there for the sessions, he said, and their horn charts were a big part of that sound. He remembers driving over from Nashville late at night with John R at the wheel, listening to his competition on the radio, forever on the lookout for the next big thing. By 1967, Otis Redding and Phil Walden had built RedWal, the company they had started together two years before, into a major booking agency that represented nearly all of the southern-based Chitlin' Circuit artists. Lattimore, like so many others at the time, left Universal Attractions and signed up with his friend Otis. There was plenty of work, and he no longer had to go to New York to get paid. He admired Redding, and considered him to be not only a great talent, but a smart businessman as well, kind of like Sam Cooke had been. 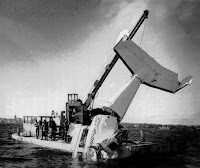 On December 10, 1967 Lattimore and his Revue had just finished up a gig in Birmingham, Alabama when he got the tragic news that Redding had died when his plane plunged into an icy lake up in Wisconsin. Once again, he just couldn't believe it. Almost three years to the day after Sam had passed, Otis, who was just so full of life, was gone too. The Revue went through the motions, and finished up engagements in Montgomery and Mobile before Lattimore, Sam Baker and The Twirlers made their way to Macon for the funeral on December 18th. Held at the City Auditorium, Lattimore told me he had never seen anything like it; "The entire town was closed down, restaurants, gas stations, everything. It was like a County Fair. There were people everywhere, lined up for blocks and blocks just trying to get a glimpse of the casket. Once the pallbearers finally brought him out, the crowd went wild, and carried his body through the streets... I'll tell you, it took the heart out of that town for years. Otis was Macon's favorite son." I guess this would be as good a spot as any to talk about Lattimore's lack of Billboard chart hits. The Sound Stage 7 singles that Richbourg was producing were guaranteed airplay on 50,000 watt clear-channel WLAC. That meant they were heard nightly in over thirty states. I imagine that Fred Foster figured that was good enough, and didn't waste his time or money promoting the records in other markets. The 45s were also guaranteed sales through the bargain 'ten-packs' from Ernie's Record Mart that John R sold over the air. None of this rang any bells with the usual indicators Billboard used in those days to compile their national R&B chart, radio station playlists and sales figures reported by record stores. 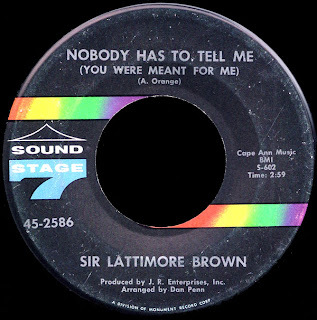 In other words, just because Lattimore never 'made the charts' doesn't mean his music wasn't heard. It most certainly was. Meanwhile, back in Nashville, the ongoing construction of Interstate 40 had completely devastated Jefferson Street, with entire blocks being bulldozed in the process. This once thriving cultural mecca had been reduced to rubble, supposedly in the interest of 'urban renewal'. You can't help but wonder, though (as many people did back then), if the project wasn't racially motivated. After all, it was the black college students from up on the hill that had staged the infamous 'sit-ins' that forced the city to desegregate its public facilities in the early sixties. Lattimore moved his base of operations to Knoxville and, although he was still represented by Phil Walden, he said his business 'went downhill' after Otis died. He was in Knoxville when he heard that Dr. Martin Luther King Jr. had been shot down like a dog in Memphis in April of 1968. 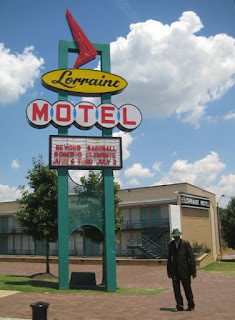 Chase and I took Lattimore to the scene of that crime, The Lorraine Motel, which is now a part of the National Civil Rights Museum. 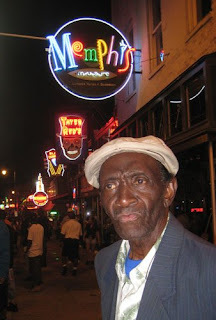 We took him there so we could film him talking about how the Lorraine was the place to stay for black entertainers in Memphis back in the day. It was at the pool at The Lorraine that he shook hands with Sam Cooke for the last time, he said, just three weeks before he was killed. Lattimore told us he didn't want to talk about Dr. King... that it was too emotional a subject for him. He told us that, and then he did anyway. You could have heard a pin drop there on that impossibly perfect Memphis Sunday morning, as he talked in hushed and reverent tones about the man he considered a martyr for his people, a man who had died there some forty years before. To be there, in that place, with this remarkable man who has lived so much of this history, was profound, my friends, and an experience I will never forget. "Everything kind of went sideways..." after Dr. King was assassinated, he told me. The nation was in turmoil, as was the music industry. The uneasy alliance between whites and blacks that had been responsible for the birth of soul was being stretched to its limits. 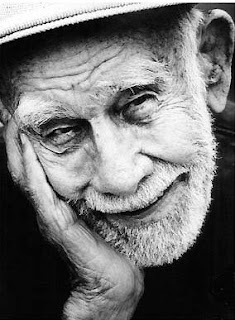 The NATRA convention was held in Miami that August, and according to Peter Guralnick, "Jerry Wexler... was hung in effigy. Marshall Sehorn... was pistol whipped. Phil Walden... was met with death threats. There were fist fights and confrontations." All was not well in Soulsville. There are stories about armed guards on the roof at American, where John R continued to record artists like Roscoe Robinson and Ella Washington, in addition to Sam and Lattimore. Something happened there in late 1968, though, and I'm not sure what it was. Willie Mitchell left, vowing never to return. So did Wexler. Papa Don was already gone, and by the end of the year so was John R. Some say that Chips threw everyone out so he could concentrate on his own AGP label, but I don't know about that... in any event, it was time to turn the page.